Stride away in this lightweight design. 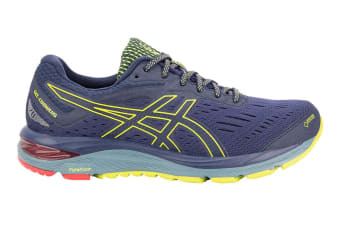 Glide through the track with ASICS Mens Gel-Cumulus 20 G-TX Running Shoes featherweight design, giving you all-round comfort and durability with Gore-Tex technology. Run the distance in complete comfort with the ASICS Men’s Gel-Cumulus 20 G-TXs durable Gel sole and super lightweight design. Get softer landings and avoid pressure point discomfort with a SpEVA foam midsole, and bounce back smoother with FlyteFoam technology. Train in all-terrain weather and conditions thanks to the breathable G-TX waterproof mush upper, helping to keep your feet dry even when running through puddles and mud.